Since we had decided to give the Deluxe Disney Dining Plan a try we thought we should also give some of Disney’s highly acclaimed Signature Dining restaurants a try too. After spending our first day at the Magic Kingdom we thought what better way to end it at the California Grill. As we entered the hotel we went up to the 2nd floor to check in and from there were taken to the 15th floor of the Contemporary where you check in again. The first thing I noticed is how incredibly loud the restaurant was and it was very brightly lit. Not what I had expected from a Signature restaurant. After checking in we waited at the bar for about 5 minutes before being seat at a table near a window where we could view the Magic Kingdom. At the table was the infamous glass slipper with a tiara placed on a bed of white carnations. A nice anniversary surprise from my husband. Our server Beckey greeted us with 2 glasses of complimentary champagne. After looking at the menu which had an extensive list of starts; flatbreads, sushi and appetizers we made a decision. 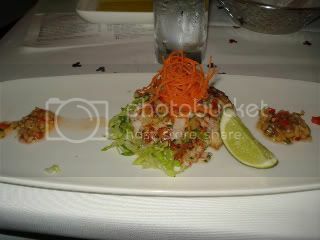 I started of with the Lobster and Shrimp Cakes which were sautéed and served with a Vietnamese melon relish. It was delicious! The cakes were full of large pieces of lobster and contained very little binding. The relish was slightly spicy and had a hint of citrus. My husband had the Spicy Kazan Roll from the sushi menu. It was crab, shrimp, bay scallops and tuna topped with fireball sauce and served with pickled cucumber and ginger. One of the best I’ve had in a long time. 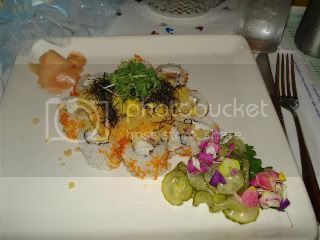 The sauce was very creamy and the sushi contained large pieces of scallops and had a nice light and fresh flavor. For our entrees I ordered the Pacific Halibut served with a red pepper and fennel compote, cranberry beans, Serrano ham and beurre blanc sauce. The compote remind me of succotash and that combined with the beurre blanc sauce was perfect accompaniments to the halibut. The halibut was light, slightly crispy on the outside and very flakey. It was then topped with some micro greens which add an extra lightness to the dish. He order the Oak-fired Fillet of Beef which was served with Boniato mashed potatoes, sautéed haricot vert (a longer thin French green bean that’s more tender than the American variety) and teriyaki BBQ sauce. The sauce was quite delicious but the filet left a little to be desired. It just wasn’t as tasty as anticipated and my husband said it wasn’t as good as the one that he had at Tony’s Town Square the year prior. During our meal Hallowishes was going on and we could see the fireworks from our table. They even had the music piped into the restaurant so we could enjoy the full effect without having to be at the park. 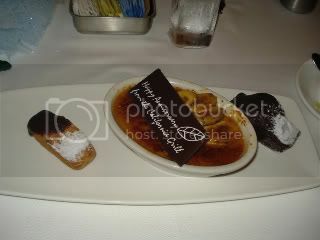 It was now time for dessert and upon Beckey’s recommendation we went with The Original, The California Grill’s legendary butterscotch crème brulee topped with caramelized bananas and served with two banana cakes that were dipped in chocolate. It was pretty good. I enjoyed the crème brulee but the bananas were a little much. They had a very strong banana flavor that almost overpowered the taste of the butterscotch. We also ordered The Year of a Million Dreams which was a cashew nut cake with peaches, raspberries and blackberries. It was topped with a ginger ice cream, nut brittle and chocolate decorations and served in a bed of lychee cream. It was delightful. The cake was light like a tea cake and the lychee cream was sinful. It was a perfect pairing with the cake. The cream brought out the nice nutty cashew flavor. The ice cream had a very light ginger and caramel flavor. This was definitely the better of the two desserts. 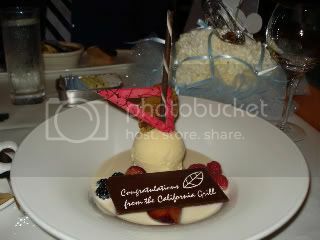 The food at the California Grill was good but not as good as I would have expected. Considering it would have cost us almost $160 + tip if we had paid for this out of pocket it wasn’t worth the money. Is it worth 2 Disney Dining Plan credits? To try once yes. It’s not a restaurant that I would dine at on every trip. There are other restaurants that are just as good if not better. A big issue I found was the noise level. It was incredibly high for a restaurant of this type. I’ve dined at restaurants in the parks that were much quieter. I could clearly hear the conversations of the other people around me. Due to the noise level and bright lighting it’s not a restaurant that I would recommend for anyone who is wanting something romantic. I enjoyed it but not as much as I had expected from all the hype.